This is the second part of the GeoGebra Sneak Peek Series. 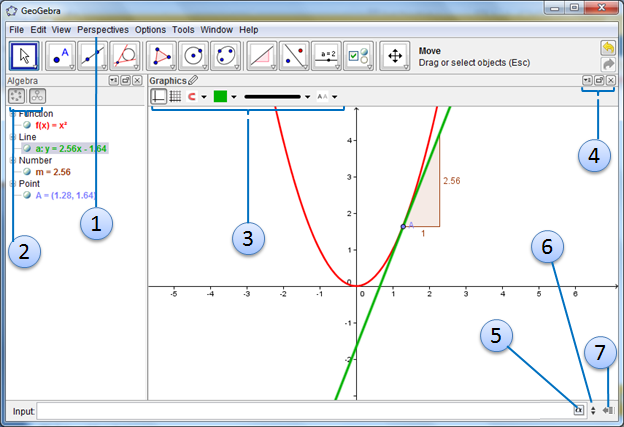 The first part is about the GeoGebra 4.0 New Tools. GeoGebra 4.0 has not only improved by adding additional tools and features, there are also “minor” changes which I think you will find very helpful. In this post, we are going to discuss the seven minor changes in the GeoGebra’s interface. This is the first part of the GeoGebra 4.0 Sneak Peek Series. In this series, we are going to discuss some of the changes in GeoGebra from version 3.2 to 4.0. If you want to have a complete view of the changes, you can read the GeoGebra 4.0 Release Notes. If you don’t know yet, GeoGebra 4.0 will be released by the end of August this year in a few weeks . If you’re as excited as me and want to try out the new features, you might want to explore the GeoGebra 4.0 Beta release. This release is, of course, not stable (they may still change some features).